AegisGuard™ LS Radiation Shields are a safe, convenient and easy to apply spray providing unsurpassed shielding protection from the radiation emitted by electrical or electronic products and networks operating within the frequencies and power levels shown below. AegisGuard™ LS shielding applications. When properly applied following the product instructions, it provides outstanding radiation shielding protection within the supported frequency ranges without affecting product performance, power consumption, or wireless product signal strength. Since the appearance of electronic products such as cellular phones are not altered, it is also the perfect precautionary safety measure for protecting children who resist changing the appearance of their products, such as cell phones. AegisGuard™ LS shielding compounds are suspended in a fragrance-free, hypoallergenic liquid with a similar consistency to very lightweight oil made from natural ingredients derived solely from plants. The liquid serves as the medium for transferring the shielding compounds onto surfaces via a fine-mist spray, where they adhere to virtually all porous and non-porous surfaces within a few seconds after being applied. It is then wiped off non-porous products having an AC or DC power source, and can either be wiped off or left in place on porous surfaces, such as wood and stone, until absorbed. Sprayed surfaces are not marred or damaged in any manner whatsoever, nor is the visibility of glass or plastic affected when the liquid is completely removed. 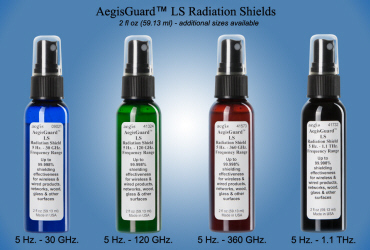 Fragrance-free, hypoallergenic AegisGuard™ LS Radiation Shields do not require grounding or contain any animal by-products, fluorocarbons, Nickel or other metal, MDF, nor is it harmful to humans or animals in any manner whatsoever. It is completely safe to use and there has never been an allergic reaction, or an effect upon wireless product signal strength, battery life, or skin reported by any user. Simply spray your electrical or electronic product with the power off, or windows and other non-porous surfaces, and wipe completely dry. It washes off with soap and warm water, and most fabrics with warm water and laundry detergent. It is even is safe enough to use on the skin. *Shielding effectiveness exceeds human RF exposure limit safety requirements as set forth in FCC OET Bulletin 65, up to 25 Watts at point of contact. (b) IEEE-STD-299 - MIL-STD 285. (c) IEEE 802.11 current & proposed - ETSI EN 302 567. (d) Available standards above 96 GHz.